well, my PURPLE BOOTS are ordered and stomping their way to me as I type! I'm excited to get them and excited about what they represent-'THE PURPLE BOOT BRIGADE,' of which I am a member, and YOU CAN BE TOO! 'The Purple Boot Brigade 'is a fundraising initiative of Ness Bradshaw & her Team at the Breast Cancer Foundation Of Western Australia. $30 from every pair of PURPLE BOOTS bought goes directly to Breast Cancer research, which I think is amazing. Being a marketing maven I love the whole 'purpleness' of the concept and the 'boot stompin out breast cancer' plus I have experienced my own breast cancer scares in the past, so this cause is very close to my heart......I can't even begin to imagine how these women feel as I only had a small peek into the nightmare of their world.....and I don't wish to ever be there again. 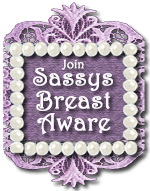 'Be Breast Aware', is the message! Are You? Their site has fantastic factual information so that you can be fully informed and in charge of your health and future wellbeing...let me ask you this.....if you won't do this for yourself, then what about for your children? Early detection of breast cancer makes successful treatment more likely. 6. www.purpleboots.com.au also have a promotion running with a special 'Test your Breast iQ' quiz. Find out how breast aware you really are before 31st March 2009 and you could win great weekly prizes. If you live in Oz you also go into the draw for your chance to win a trip for 2 to Thaliand with $1000 spending money.